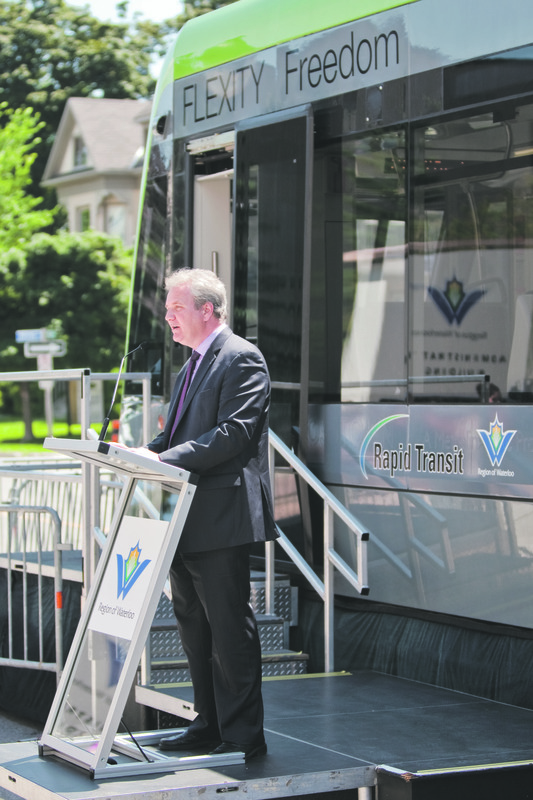 A version of an ION train was parked in front of the Region of Waterloo headquarters on Friday for residents, local media and government officials to get the first glimpse of what the $818-million light rail transit (LRT) project will look like in 2017. 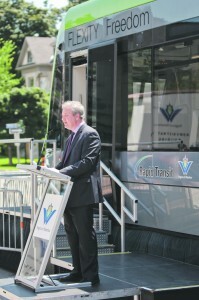 A model of the first part of an ION light rail vehicle (LRV)– a vehicle from Bombardier under its Flexity line – was placed on display on Fredrick Street in downtown Kitchener. Mike Murray, the chief administrative officer for the Region of Waterloo, hosted the unveiling of the model, which featured speeches from regional councillor, Jim Wideman, MPP John Milloy and Bombardier VP of Operations, Rene Lalande. Also in attendance were MP Peter Braid and MPP Michael Harris, with about 75 people gathering around the model to watch the official unveiling. “These kinds of projects and getting to milestones like today take a huge amount of work by a huge amount of people, so one of themes of today will be partnership, collaboration and working together,” announced Murray at the beginning of the ceremony. The model on display featured the driver’s area, some seats and the exact width of the train car – a vehicle that already appears to be a lot more spacious than the buses in the Grand River Transit (GRT) system. 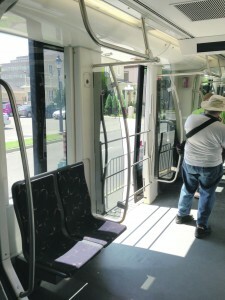 According to Wideman, the final version of a LRV will seat 56 and have a maximum capacity of 200 people. He noted that the ION will be the “first of its kind in Canada” and production continues to be “on time and on budget.” The project will be implemented in two stages with the first stage – a 19 km track from Conestoga Mall to Fairview mall – to be completed by 2017. Although approved by regional councilors in 2011, the LRT system in Waterloo Region has seen its fair share of opposition, some of which resurfaced earlier this week. Through a petition on Change.org on July 10, Ted Livingston, the CEO of Kik Interactive, tried to reignite the opposition to the project. But Tom Galloway, a councillor at the Region of Waterloo, said it was too late. One of the reasons as to why the region moved toward a LRT system is to reduce congestion without having to expand urban sprawl. “I’ve found, by driving around the community, is that there are issues with congestion and traffic problems, and we’ve got to address it and this is going to address it head on,” Milloy told The Cord. 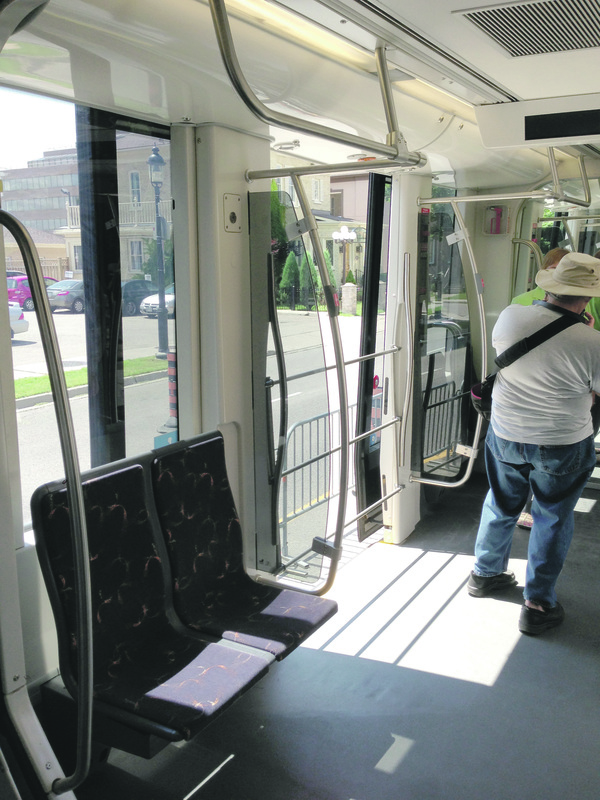 The LRV model will be on display Saturday from 10 a.m. to 3 p.m. for the public.